My husband Nacho and I just got back from New York City, where we stayed at the St. Regis while we worked on a fun project for Departures Magazine. It was another one of those lightening trips! As I often mention in my blog stories, for a long time the two of us have been globetrotters, most often with our four kids, exploring innumerable cities in the name of polo. We have stayed in loads of hotels, but the mighty St. Regis rises far above the rest. The first time I stayed there was a decade ago when our first two children, Hilario and Aurora, were toddlers. At that time, Nacho and I were participating in the high-goal winter polo season in Wellington, Florida. Nacho told me he had a meeting about organizing a match in New York at a hotel called the St. Regis, which at the time meant nothing to me, and he wanted me to go along so we could have a romantic grownup night. This idea of a jaunt like this was kind of a big deal because I had never before left my baby girl, who was at the time two years old. Nevertheless, I couldn’t turn down a night alone with my husband in a posh hotel! Aurora would survive just fine with the good care I would leave her in, I knew. And we all know how valuable it is for parents to spend time together away from being on family duty. Jumping into bed that very first night at the St. Regis was, to put it lightly, a very memorable and pleasurable experience. The bed in our room was far and above the most comfortable and soft bed I could ever imagine. I felt like I had been sucked into a fluffy cloud! This and many other positive qualities of the St. Regis (that I write about below) made me quickly besotted with the place. I noticed right away that the staff was intuitive about attending not only to everything I would ask for, but also things I hadn’t hadn’t thought to ask for. In the famous King Cole bar of the St. Regis, where in 1934 bartender Ferdinand Petiot invented the Bloody Mary cocktail, Nacho and I feel very relaxed at sundown in its dark wood, beautifully lighted atmosphere. We order either the Bloody Mary, which has just the right balance between spicy and smooth, or a fernet with Coke and lots of ice. Fernet is an Italian bitter that usually includes a complex combo of myrrh, chamomile, rhubarb, cardamom, aloe and saffron. Mmm. So good. The bar is a small but sophisticated and casual place. There’s a gorgeous mural that takes up the entire behind- the-bar space depicting the children’s tale about Old King Cole that the artist Maxfield Parrish, one of my favorites, painted for one of the famous Astors in 1906. That’s how the bar got its name. When the children are with us, they beg to go to afternoon tea at the hotel in the late afternoon. Lady Astor had a tradition of meeting there with her friends to go over the latest gossip in privacy, while being served delectable sandwiches and cakes. Can you imagine the juicy tidbits the servers would overhear? We look forward to the Scottish salmon sandwich with lemon butter on pumpernickel and the duck prosciutto with pineapple and truffle oil. There’s no way we’re getting out of there without one of the St. Regis’ raisin scones with lemon curd. To die for. The apple pastry with hazelnuts is also a fave with the Figueras family. There are many, many teas to choose from, from smoked black to Japanese green to fruit and herb infusions. If you’re celebrating something special, the menu also handily includes a special bottle of Grande Dame Verve Clicquot champagne to pair with your yummy sandwiches and desserts. And you get to keep the wine flutes! We have had wonderful stays at both their Rome and Singapore hotels, among others. In Singapore, we played a tournament in the beautiful and renowned Singapore Polo Club, founded in 1886, that is still standing right in the middle of the city. A big family milestone happened in the Singapore hotel when our third child, Artemio, suddenly began to crawl for the first time! 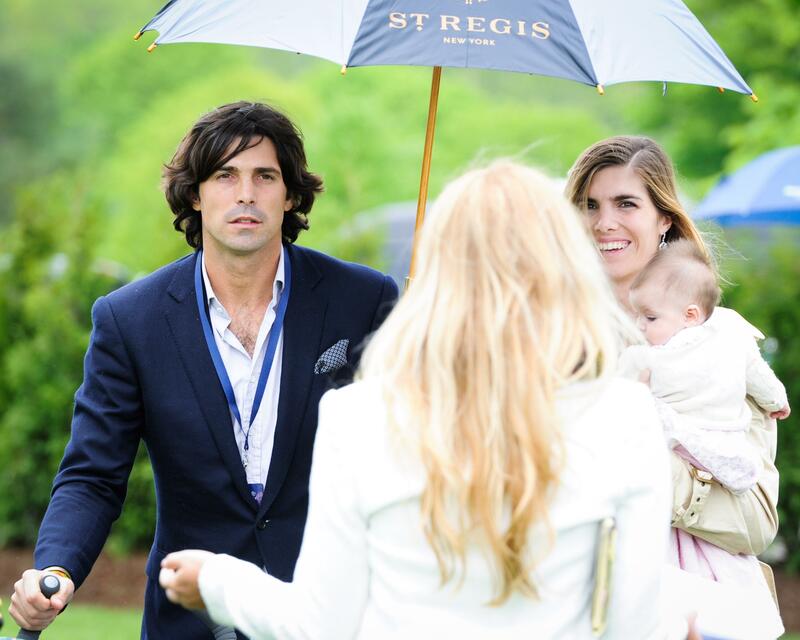 As the years have gone by, the relationship between the St. Regis and our polo interests has grown ever stronger. The hotel continues to be one of our strongest partners. No matter which city we travel to, the St. Regis goes the extra mile to make sure the staff attends to every detail of our stay with efficiency and elegance. They know hospitality like nobody’s business, believe me. So nice to look back on why you fell in love with the place. I’ll for sure plan st regis in when in NYC …especially the juicy gossip over hightea &scones … guillty pleasure ! Curiuous to hear about the magazine project. i love Starwood hotels in general. Which St. regis is your favorite? yOU DEFINITELY LEAD A LIFE OF LEISURE. i ENJOY READING YOUR NEWSLETTER AND ALWAYS TAKE AWAY SOMETHING LUXURIOUS TO DO FOR MYSELF, SHOP, BUY SOME FINE FOODS. BECAUSE WE ALL DESERVE IT ONCE IN AWHILE, RIGHT? i TOO, AM A mAXFIELD pARRISH ADMIRER. i MUST SAY, AS A HORSE OWNER OF 2 HORSES, i ENJOY READING ABOUT YOUR HORSE EXPERIENCES AND SEEING PICS. AS AN EQUESTRIAN AT AN EARLY AGE, YOU MUST HAVE BUILT UP SOME STRONG LEG MUSCLES. iT TAKES ALOT OF RIDING TO BUILD MUSCLE BUT THEY ARE A NECESSITY IF YOU WANT TO STAY SEATED.